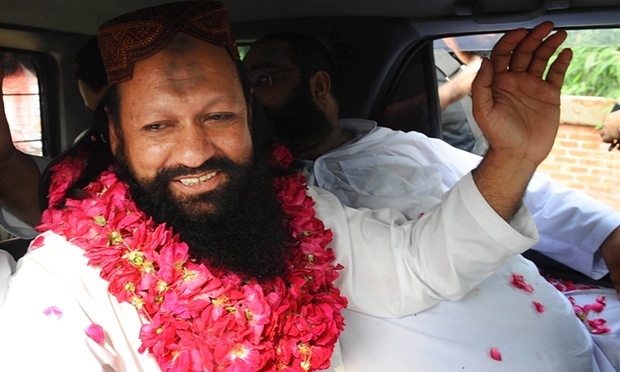 Leaders of Pakistan’s most infamous sectarian terrorist group, including its founder Malik Ishaq, were killed in a gun battle with police on Wednesday that many suspect may have been deliberately staged. Ishaq and 13 other militants from the Lashkar-e-Jhangvi (LeJ) – including two of his sons and a top official – died after gunmen attempted to free them from custody in a pre-dawn operation, police claimed. The al-Qaida-linked group, which Ishaq co-founded in 1996, is notorious for its attacks against Shias, as well other minority groups including Christians and Ahmedis. Rai Muhammad Tahir, the head of Punjab’s counter-terrorism department, said Ishaq had offered to take police to an arms dump after he was arrested on Saturday. “A special team was organised to visit the area with Malik Ishaq, his two sons and colleague Ghulam Rasool to recover explosives from a house situated in Shah Wali area of Muzaffargarh,” Tahir said. “The moment the special team arrived at the place, some 20 militants attacked and tried to free Malik Ishaq and others. In a direct exchange of heavy fire, Malik Ishaq, his two sons and colleague Ghulam Rasool were killed along with 11 others,” he said. The haul of weapons recovered from the house included 40kg of explosives, suicide bomb vests and guns, Tahir said. The account raised immediate suspicions among some observers that the battle may have been an “encounter” – the name Pakistanis give to contrived killings of troublesome terror suspects whom the courts have been unable to convict. Tahir was unable to explain why police had required so many senior LeJ leaders to attend to the identification of the weapons cache. Asad Munir, a retired officer of the inter-services intelligence directorate (ISI), Pakistan’s top spy agency, said “an encounter cannot be ruled out”. Ishaq’s killing proved that Operation Zarb-e-Azb, a major push against militant groups launched by the army last year, was being “conducted across the board”. “We have seen throughout this operation that no one is being spared,” Munir said. Whether or not the killings were staged, the death of Ishaq marks a striking change in fortunes for LeJ, which has long dodged government attempts to crack down on its activities. Despite being the head of an organisation linked to al-Qaida and designated by the US in 2014 as a “specially designated global terrorist”, Ishaq had never been successfully convicted by a court system where witnesses, judges and prosecutors are easily intimidated. In one case in 2011, Ishaq made sure the trial judge was aware of the risk he was running by reading out the names of his children. Ishaq had been implicated in dozens of lethal attacks on Shia religious processions and mosques and in a local newspaper interview in 1997 even admitted to having been involved in the killing of more than 100 people. Instead, public order laws were used to hold him for long stretches in police custody or house arrest. After the collapse in 2011 of a case in which he was accused of masterminding the 2009 attack on the Sri Lankan cricket team in Lahore, Ishaq was greeted by hundreds of supporters, who garlanded him with flowers. In addition to his involvement in terrorist attacks, he regularly stoked anti-Shia hatred with bloodcurdling speeches to his supporters. Despite the weakness of the courts, many sceptical analysts believed Ishaq must also have enjoyed the patronage of Pakistan’s intelligence apparatus, which has long had murky dealings with militant groups, some of whom were used to further the country’s regional ambitions. In 2009, Ishaq was even drafted to assist the army in an attempt to negotiate with terrorists who had attacked the army’s headquarters and taken several people hostage.